Department of Plastic Surgery, Medical College of Wisconsin, Milwaukee, USA. Techniques for facial rejuvenation, like many other cosmetic procedures, at times tend to ride the wave of public opinion, or leap to a manufacturer’s pricey new device that promises miracles. Many surgeons rush to follow the "influencer's" advice which at times can be inspirational or at other times be destined to fade like a falling star. Lately however, the ideas regarding facial and neck rejuvenation have had a slow but steady shift based on a better understanding of facial and neck anatomy and on enhanced insight into the biochemical and mechanical changes that result in an individual's aged look. This understanding has allowed us to go beyond simple skin tightening or some individual surgeon's variation of soft tissue elevation made seemingly simple but without a scientific basis or long-term results. We stand now at the early stages of our comprehension that facial aging is a constellation of issues within a 3-demensional platform. We know that beyond simple skin laxity or soft tissue descent, there is adipose atrophy in different compartments combined with changes in the underlying boney framework, genetically mediated biomechanical alterations in the soft tissue matrix that allow that laxity of skin and soft tissue to be visibly interpreted as an aging look. We feel that it is only in understanding this continuously changing, complex amalgamation of structures at both the macro and micro level can we, as clinicians, attempt to currently treat our patients appropriately and at the same time hope to see our craft of "youth creation" change in a direction that is scientifically and logically directed. As an example, the modulation of the facial soft issue complex by fat grafting can be looked at simply as volume replacement or it can be understood that there are other interactions that occur at the molecular level when exogenous fat is added to the face that can stimulate a process of molecular rejuvenation that may even be seen by the outside observer as a more youthful appearance. How does this understanding help us now? We feel that facial rejuvenation techniques have made quantum leaps during the last decade thanks, in great part, to this better understanding of all these concepts and we are only at the beginning. Appreciation of these issues can lead to less invasive techniques, quicker recovery strategies, and refined surgical procedures. We hope in this issue of PAR to try to review our current views of these subjects, the procedures that allow us to apply that understanding and to potentially peak into the future for other possibilities that may lead to less invasive, longer lasting and more natural looking results. Successful rejuvenation of the face and neck is not just about the best procedure, but all about the best way to combine many different techniques, at different times and in the appropriate sequence; from in office and off the shelf treatments to complex surgical procedures. 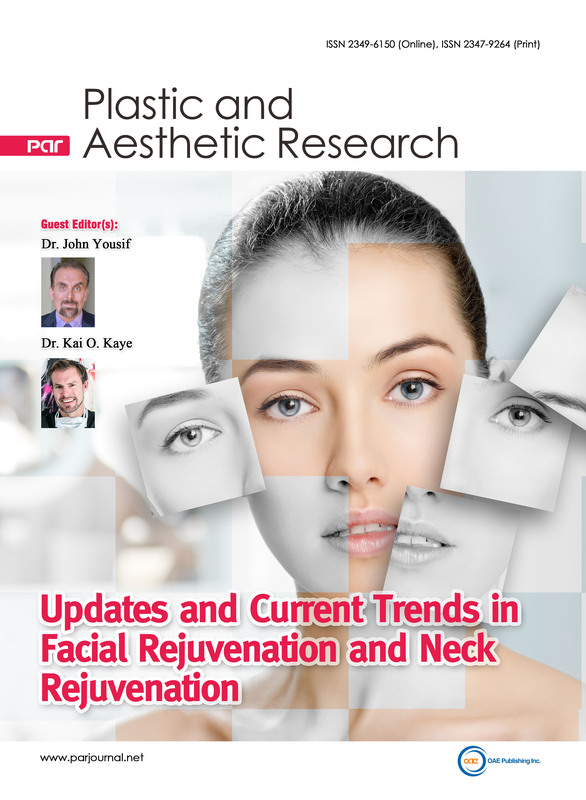 To this end, it is our intention that this issue of Plastic and Aesthetic Research will serve as an up-to-date overview of all these different techniques, making it easier for our colleagues to achieve great results for their patients.